We may be over halfway through April, but LGBTQI (Lesbian, Gay, Bisexual, Transgender, Queer/Questioning, Intersex) Awareness Month is not over yet! Our Out in Reel: LGBTQI Awareness Month Film Series continues tomorrow evening, April 20th, with a Double Feature screening of Straightlaced and Outlaw. Straightlaced includes the perspectives of teens who self-identify as straight, lesbian, gay, bisexual or questioning and represent all points of the gender spectrum. With courage and unexpected humor, they open up their lives to the camera; it quickly becomes clear that just about everything teens do requires thinking about gender and sexuality. 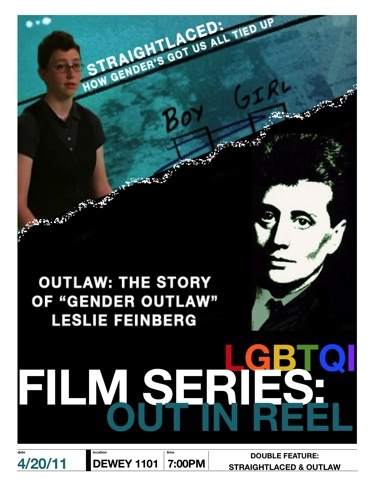 Also screening at Out in Reel tomorrow evening will be the short documentary Outlaw, the story of “gender outlaw” Leslie Feinberg. Leslie Feinberg, a self-identified “gender outlaw” who has spent much of zir life passing as a man, speaks with passion and intelligence about zir experiences in this video manifesto. Raw and confrontational, this film asks its audience to examine their assumptions about the “nature” of gender and calls for more sensitivity and awareness of the human rights and the dignity of transgendered people. This Double Feature is free and open to the Greater UR Community. The screenings will begin at 7:00pm in Dewey 1101 and snacks will be provided. Next Wednesday, 4/27, we will wrap up Out in Reel with a screening of Two Spirits, also in Dewey 1101 at 7:00pm. Check back next week for more details! After our Double Feature screening, join Pride Network at 8:00pm in the Gamble Room, where they will be hosting their semesterly education panel. A panel of students will discuss their experiences and insights growing up with dual identities; these students represent their racial or ethnic identity and also identify as LGBTQI. This is an opportunity to approach a topic that is frequently forgotten in discourse – intersectionality. While we realize this overlaps with the end of our Double Feature by about 30 minutes, Pride Network President Andrew Moran welcomes late comers, too! One of the reasons we are pushing for a center is to bridge the gaps in current supportive networks for LGBTQI students and their allies. There is not a current institutionalized office for LGBTQI students. 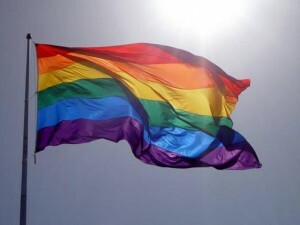 LGBTQI individuals are have unique needs that are not shared by other minority communities. LGBTQI identified individuals have to deal with the process of coming out in an environment where they are surrounded by people who do not identify as they do. As of now, it is difficult to reach students who are closeted on campus, and who need the most support. Moran is collecting petition signatures to show the administration that there is a need and want for such a center here. For more information about the project and petition, please email andrew.moran@rochester.edu or to sign the petition, click here. This entry was posted in SBAI Events, UR Events and tagged #calltoaction, #filmseries, #LGBTQIawarenessmonth. Bookmark the permalink.